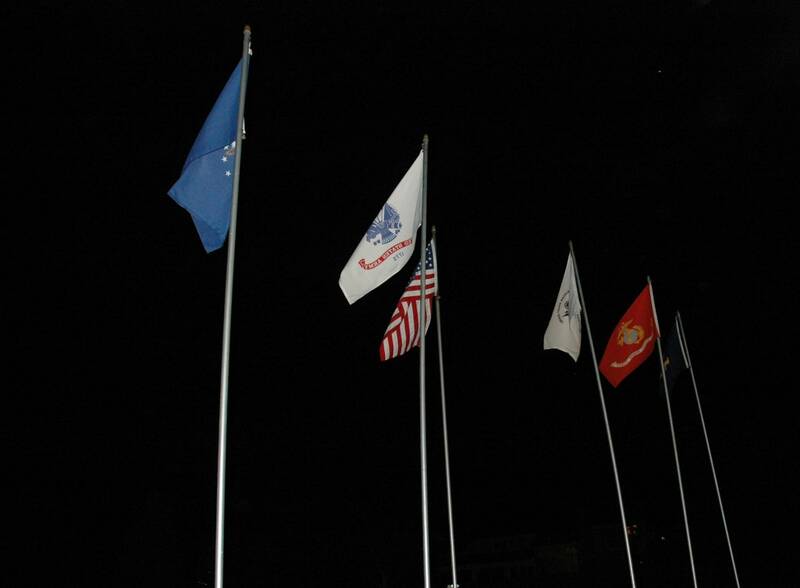 One of our most rewarding lighting projects was completed this week as we installed a new low voltage lighting system to illuminate a veterans memorial at Piney Creek Park located in Centennial, Colorado. The memorial consists of six flags – the U.S. flag as well as a flag for each of the 5 branches of the military – Army, Navy, Marines, Air Force, and the Coast Guard. The flush mounted well lights with 35W quartz halogen bulbs were installed with tempered glass lens covers. Since a grass lawn surrounded all of the flag poles, the lighting fixtures were additionally protected by poured concrete caissons to protect them from lawn mowing damage, etc. 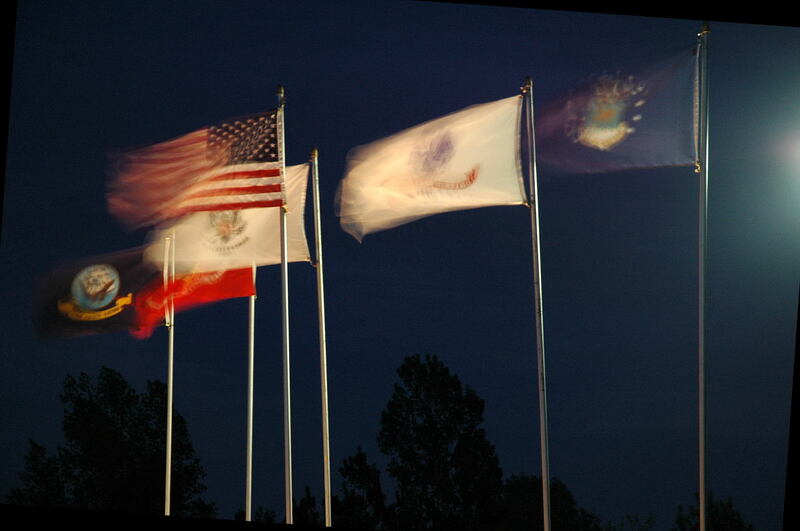 Another photo to the right shows the flags in motion due to a brisk wind last evening. In fact when our crew was on site earlier this week installing the lighting, they experienced wind gusts approaching 70 miles per hour. In fact, the flag contractor was there at the same time to replace two of the flags which required that the flag poles be lowered to a horizontal position. Because of the wind, it took the flag contractor along with some of our crew to help raise the flag/flag pole back to a vertical position. With Memorial Day a few days away and with the recently completed HBO series The Pacific that was produced by Tom Hanks, the flag raising evoked images of the raising of the U.S. flag on Iwo Jima during World War II. The ultimate sacrifices that our young men and women have made in the service to our country for over the last two centuries cannot be overestimated. As we enjoy time off from work with our friends and family this Memorial Day weekend, please reserve some time to remember the millions of Americans who served our country both in war-time and peace-time, who were severely injured and/or are still suffering debilitating injuries, and those who paid the ultimate price of giving their lives. And if you encounter a vet during your daily activities, please extend the courtesy of thanking them for their service. Or better yet, attend a Memorial Day Parade where some of the few surviving World War II veterans may be marching. I recently heard that 1,000 WWII vets are dying daily.